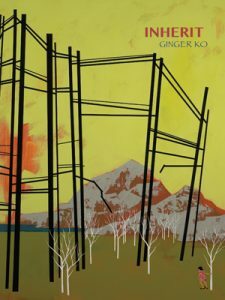 Ginger Ko’s new collection, Inherit, is, as the name professes, a gathering and rendering of inheritances. The poems comprise an intergenerational compilation of voices speaking to a multitude of experiences, thoughts, curses and blessings handed down over years and through bloodlines. This multiplicity of voices urges the speakers of the book toward an understanding of self, of history, though try as they may, full assimilation never quite arrives. In its place, by the final pages, looms an inevitable acceptance of discomfort and perhaps even a reluctant appreciation for the gifts the past bestows. which subtly informs the poems contained in Inherit—because there is gap in knowledge that exists between the generations brought to life here, a gap that needs constant traversing. The gap is a product of immigration, of expectation, of cultural clash. Like all families, the women Ko weaves together here speak their own language: throughout the “Lacunae” sequence, each left-side poem coexists with a right-side “translation.” In effect, Ko creates a codependency for her readers, one that is mirrored throughout the first sequence—the translations function as requirement and exposure. As the poems unpack a complex past, one wonders: do these voices hear one another? Is it a chorus or a cacophony? Perhaps, as so much in Inherit is, it is both. Either/or doesn’t apply to the poems here, for Ko and for the speakers of her poems, it is only and and and and and: “She was head of a household of mothers and daughters. She painted ceilings, patched the dents in the garage door, screwed in new locks. She did and did until…” Until, of course, the speakers are desperate to escape. to believe—this blood is for testament. I confess I don’t read nearly as much poetry as I probably should, in part because of my enduring quest for narrative, which I generally find lacking in contemporary poems, and especially in collections. But Inherit crosses the bridge that I always want to see crossed. 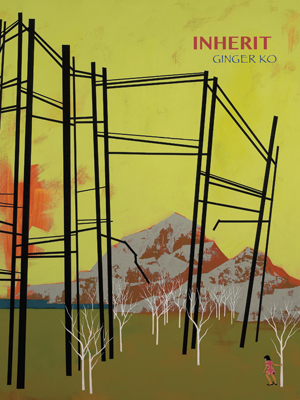 Ko’s masterful and measured language opens the door to a gathering of stories that feel equal parts lyric refrain and family saga. Inherit is crowded with the past. As the “Sequalae” sequence makes clear with long poem titled “Alien,” the “I” (which, miraculously, feels at once singular and vast) is aware of all that she has been handed down, and aches to comprehend it, yet still struggles to know how. The lines “but still with secrets” and “I have always been real / though you forgot for years” and “I raised a pup from birth / and was shocked when he grew / to look like any wild wolf” speak to this unknowing, this wily dance of haunting. This shape of inheritance, a body too similar. is unforgiving but not without necessity. Ko’s speakers seek to move beyond the formality of piety, expanding into deliverance—whether or not they are successful remains to be seen. Like a family dinner where everyone talks over one another, Inherit will fill your heart with joy and set your teeth on edge and continue ringing in your ears for years and years. Sara Rauch’s debut story collection, What Shines from It, is forthcoming by Alternating Current Press. Her prose has been published in Hobart, Split Lip, Gravel, So to Speak, Qu, Luna Luna, and more. She lives with her family in Easthampton, MA.